Are you TIRED of the RAT RACE? Do you wish you had MORE TIME and MORE MONEY? Would you like to NEVER WORK AGAIN? 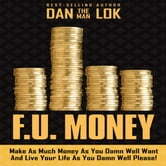 If you answered “YES!”, then you need to look no further than Dan “The Man” Lok's new book - F.U. MONEY. If you have ever thought to yourself: How come I have to keep back to this DEAD-END JOB? How can I make enough money to afford to STOP WORKING and START HAVING FUN?? When will it be MY TURN to live the GOOD LIFE??? Imagine how your life would become if you knew what it really takes to make more money that you have ever dreamed possible. For instance, can you imagine that... All the money stress in your life suddenly vanishes? You get to fire your boss and tell him where to shove it? Take holidays whenever you want and for as long as you want? You are living in the house of your dreams, driving the car of your dreams and also have a boat and a cabin and even a plane if you want? You can afford to give your children the perfect, healthy, fun and fulfilling childhood that you always wanted to give them? In this no-nonsense, no-holds-barred guide, international entrepreneur, best-selling author, and self-made multi-millionaire Dan Lok shows you how to live the lifestyle you really want without having to work or rely on anyone else for money.